Wat Arun, locally known as Wat Chaeng, is situated on the west (Thonburi) bank of the Chao Phraya River. It is easily one of the most stunning temples in Bangkok. 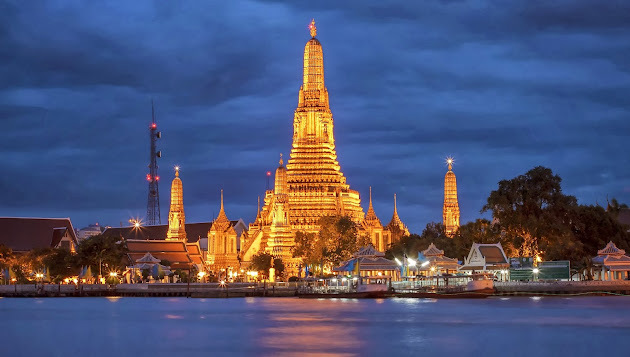 Why Temple of Dawn (Wat Arun) is special ? Wat Arun was envisioned by King Taksin in 1768. It is believed that after fighting his way out of Ayutthaya, which was taken over by a Burmese army at the time, he arrived at this temple just as dawn was breaking. He later had the temple renovated and renamed it Wat Chaeng, the Temple of the Dawn. It used to be the home of the Emerald Buddha, before the capital and Palace was moved to the other side of the river. This can now be seen at the Grand Palace. The central prang was extended during the reign of Rama III (between 1824 and 1851), and is now one of the most visited sites in Thailand. It was also Rama III who added the decoration of the spires with porcelain, so that they glimmer in the sunshine. What to explore at Temple of Dawn (Wat Arun)? We would recommend spending at least an hour visiting the temple. Although it is known as the Temple of the Dawn, it's absolutely stunning at sunset, particularly when lit up at night. The quietest time to visit, however, is early morning, before the crowds. Given beauty of the architecture and the fine craftsmanship it is not surprising that Wat Arun is considered by many as one of the most beautiful temples in Thailand. The spire (prang) on the bank of Chao Phraya River is one of Bangkok's world-famous landmarks. It has an imposing spire over 70 metres high, beautifully decorated with tiny pieces of coloured glass and Chinese porcelain placed delicately into intricate patterns. You can climb the central prang if you wish, the steps are very steep but there is a railing to balance yourself. Getting up is as tricky as getting down! When you reach the highest point you can see the winding Chao Phraya River and the Grand Palace and Wat Pho opposite. Along the base of this central tower there are sculptures of Chinese soldiers and animals. Head into the ordination hall and you can admire a golden Buddha image and the detailed murals that decorate the walls. Although Wat Arun is a very popular for tourists, it is also an important place of worship for Buddhists. Make sure you dress appropriately, or pick up one of the cover ups that are for rent near the entrance. How to get to Temple of Dawn (Wat Arun)? Wat Arun is almost directly opposite Wat Pho, so it is very easy to get to. From Sapphan Taksin boat pier you can take a river boat that stops at pier 8. From here a small shuttle boat takes you from one side of the river to the other for only 3 baht. You need to wear properly when you enter the temple. You need to wear comfortable shoes as the steps are really steep. One of the most attractive temples in Thailand. Wat Arun is considered one of the most well known of Thailand's many landmarks. The full name of the temple is Wat Arunratchawararam Ratchaworamahawihan. Named after Aruna. The temple is so named because the first light of the morning reflects off the surface of the temple. Great location that you can link in with a longboat tour on Klongs. Magnificent structure in lovely grounds. If you only want to see a limited number of temples, this is a good one to see. When you get to the top of the temple you'll have some nice views of the city. Climbing up and going down those steep stairs is adventure itself :) There was no admission fee.Definitely worth visiting while in Bangkok. Catch the ferry to varying different parts of Bangkok (there is a dock at the temple)Beautiful place but at all Thai temples that attract tourists be where of scams. Dont give personal details if you choose to fill in surveys (this information could save your life so don't be naive or cocky about it). Pick pocket gangs are rife around the tourist areas so use your street smarts and you will be fine.